Pros: Great price. Fantastic viewing angle. Great picture quality. Innovative and effective Bluetooth remote. Even LED backlighting. Wireless works well. Cons: The TV menu needs to be redone so it makes more sense. A little heavy for an LED tv. TV booklet missing answers to key questions. Key Takeaway: The Vizo XVT553SV is one of the best dynamically LED Backlit TVs that you can get for the money. It is a highly recommended solution for those of you who do not care about 3D. 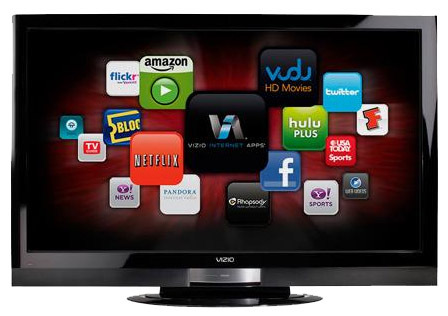 Today we will be reviewing the Vizio XVT553SV. If you own the XVT423SV, or XVT473SV then you should stick around as these TVs use the same technology and this review will apply to you as well. 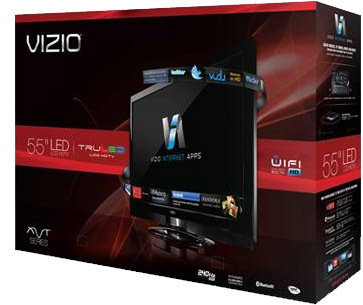 The XVT553SV is Vizio’s top of the line non-3d model. It uses the new LED dynamically backlit technology. Let’s dive in now with a feature table. Wow that is a lot of features. This is sure one hefty piece of equipment. So let’s just jump right in and discuss it. The Vizio XVT553SV is a stunning piece of work. In the front you have no buttons. The only thing to distract you from the screen is the soft glowing Vizio Logo. This Logo will be lit at all times and changes color depending on what is going on with your TV. It can tell you that you are currently undergoing an automatic firmware update, that the XVT553SV has errors, that the TV is in standby, and that the TV is on. Kind of important huh? Depending on where you keep this in your house, you may want to cover it up with some masking tape if the glowing hurts your sleep. It is really soft though. You will find the power button carefully fitted. I actually didn’t know about this till days later because it was so well hidden. We have a black border that goes around the entire TV. Although this border is larger than some of the competitor’s TVs that are trying to go for the borderless look, it still looked beautiful with or without the picture on and is not distracting at all. We found the TV to be a little thicker than the LED competition, but it is important to note that most of the “thin” LED TVs out there use edge lighting and not full backlighting. This causes uneven picture, potential blooming, and possibly bad color. This is why we applaud that Vizio went ahead and took the slight thickness hit in order to give us improved picture. The back of the TV is clearly labeled and makes it very apparent where everything is. They even rank the connections on the back (labeling HDMI as best of course.) Everything is well spaced and easy to access. 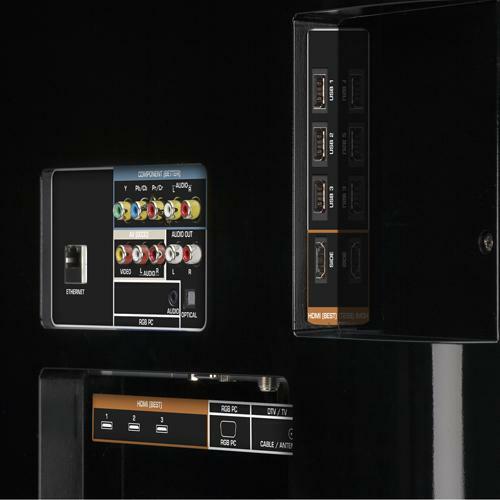 On the rear, we have four HDMI inputs with HDCP with the first HDMI Connector (HDMI Input 1) supporting the new HDMI 1.4 Audio Return Channel. We also have an Ethernet Port, a Computer RGB Port, Component Video with Stereo Audio, and Composite Video. Finally, you will also find a SPDIF Digital Optical Port and Stereo Audio Port. As I said earlier, everything is labeled accordingly. These connections feel solid and well constructed. They are placed in easy to access locations that should not cause any problems. The only time you will have issues with connections is if you are using an extremely stiff cable, but you will generally always have that issue with a stiff cable. On the side, you will find one additional HDMI port with HDCP, as well as three USB Ports. These USB Ports are pretty much useless and never ended up having any notable features. Because there are so many connections, you will have trouble shoving in the cables if you are utilizing all the connect ports. This again, is a problem any TV would have when utilizing so many connections but I wanted to go ahead and say it. Here we have the Vizio remote. This remote works via Bluetooth but also can output in RF. We found this extremely pleasant because Bluetooth does not need line-of-sight to work like a traditional RF controller. It was able to sync in a matter of seconds with the digital cable box and provided great feedback. We would’ve liked it to be slightly more responsive, as there was a slight lag at times. All the buttons were well positioned and sized. For a remote with a keyboard inside of it, it was very light as well. Mounting the Vizio XVT553SV was a piece of cake. The whole process took about an hour. There were no hidden surprises that we came across. The TV supports the Universal Mounting Standards so you should not have an issue. The TV comes with a few pieces to mount it as well. Not much to say here other then the fact that the TV will look beautiful when we will be watching the Super Bowl this weekend. Now let’s go to the part that you really care about… the picture quality! Vizio has packed in a lot of features here. We decided that we liked the Vizio best with the Football Picture Mode Setting. If you need something darker, the Movie Setting worked well. There are also a ton of adjustable options. We found that this TV had no signs of blooming. Blooming is halo-like effects from improperly distributed/leaked lighting for LED TVs. Backlit and Edgelit LED TV’s can frequently suffer from this. This is because the LED lights are concentrated in certain areas and does not always display properly under certain picture conditions. The Vizio XVT553SV provides rich colors, dark blacks, and very light whites. The picture quality was exceptional as well and provided sharp/crisp images. I was extremely impressed with this TV and its quality. Vizio rated this TV to have a 178 Degree Viewing Angle. This is definitely the case. We are able to watch the television with little picture distortion from most angles. The 1080P Content looked absolutely stunning. The TV was able to keep up with fast speed sports such as football. Heck, we even watched the super bowl on this fine specimen. We were also very surprised with how well this TV could scale regular 480i content. Dynamic lighting works fine, but darkened the picture a little much for our taste. At all times through the day, the XVT553SV still looked great. There are more than enough options to change and coloring if you have any problems, though you will find more settings to alter in more expensive TVs. Here we were not as happy as we could be. At first glance, you will like the menu of the XVT553SV. And for most purposes you will not have a problem with it. The Vizio uses the same interface, even with its Apps which is nice. Some things you will have trouble finding though. For instance, if you wanted to use dual tuner functionality you will have to disable parental controls to get access to other features. There is also no manual option to check for updates, or at least we couldn’t find it. The current auto-update interface is a very nice touch. The TV will update when it is in standby. You can tell because the glowing Vizio logo will change and when you turn the TV on you will see an “updating” message. We updated the TV over wireless without any problems. The update only took a couple of minutes. There is a range of TV applications to choose from that is being expanded. We tried a few features out like Facebook and Pandora. You have to set Pandora up on the computer prior to using it on the TV. The game we tested played just fine as well. As we said earlier, the apps were well integrated too. Conclusion – Vizio hit a home run with the XVT553SV! So without a doubt, Vizio really made a competitive product here. 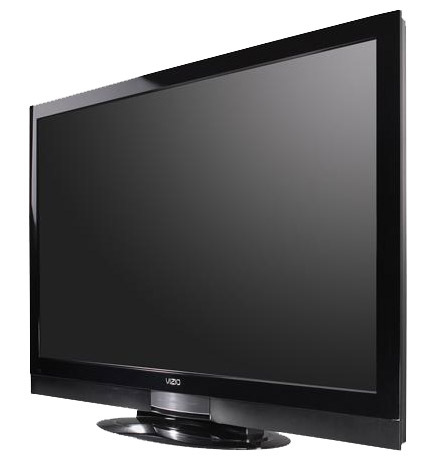 Not only is the Vizio XVT553SV a high quality television with amazing features, it is very affordable. If you do not mind the television being thicker than a standard LED TV, then this TV is for you. Because of its great features, we rate the Vizio XVT553SV and its series, a 4.75/5.0. This entry was posted	on Wednesday, November 16th, 2011 at 11:26 PM	and is filed under . You can follow any responses to this entry through the RSS 2.0 feed. You can leave a response, or trackback from your own site.